For those looking to sit inside on a Friday afternoon and look at pictures of cool archaeological examples of figurines from the US and UK, my sabbatical lecture Friday February 24th is your chance. 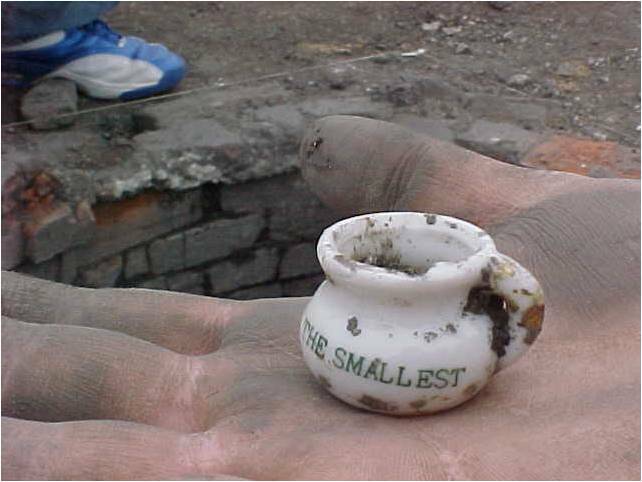 "The smallest" Japanese porcelain chamber pot curio, circa 1920-1940, excavated in the 400 block of Agnes Street (now University Boulevard), Indianapolis. I find Hoarders absolutely captivating, not because it is a fascinating human train wreck but because it is a chronicle of the compelling power of material things. At some level hoarding tales are amplified magnifications of all the frailties most consumers have somewhere within us, and of course our own tendencies to hold onto lots of things seem much less neurotic when we compare them to the tragedies that people Hoarders. Nevertheless, some of the fascination is because Hoarders is really about something most archaeologists and material culture scholars understand. Hoarders invest things with profound consequence, viewing objects as vessels of personal memory, social potential, and symbolic significance, even though that meaning gets indiscriminately invested in goods that really should be in the archaeological record instead of a living room piled high with every possible object. Hoarders‘ narrative framework is exceptionally clever, constructing elaborate psychological tales around these assemblages of goods as the show parades out sober counselors (e.g., “I’m Matt Paxton, and I’m an extreme cleaning specialist”) and shocked or emotionally deadened family and friends. As these professionals and friends excavate the assemblage, unnerving music sporadically punctuates the horrible surprises within the archaeological matrix that is a hoard. While this is a pretty compelling structure for their storytelling, it risks reducing the stories to shallow accounts of personal tragedy and neurosis, focusing on the genuine medical condition but evading what actually magnetically draws many of us to such shows: much of the hoarders’ mindset is shared by viewers who accumulate things, endlessly plan to organize, and slowly cram their homes. Many households are stocked with things simply because we have so little time to cull all the things that are no longer needed, but for many more of us many of the things in our homes are just as laden with social and personal significance as virtually every object is for a hoarder. There is now a whole genre of these shows, which narrowly include Hoarders on A&E, Clean House on the Style Network, Extreme Clutter on OWN, Hoarding: Buried Alive on TLC and even Confessions: Animal Hoarding on Animal Planet. To emphasize that Americans are not alone with these issues, BBC has had similar shows including How Clean is Your House? and Life Laundry. But broadly the genre includes more bourgeois friendly shows that focus on cleaning, clutter, and organization or champion the ambiguity of a “simple life,” like Mission Organization on HGTV, Neat on Discovery, and Small Space, Big Style on HGTV. And of course there are countless blogs on hoarding that approach it as an aesthetics (e.g., If I Were a Hoarder), a complex scholarship of things (e.g., the intellectually ambitious Discard Studies), personal tragedies (e.g., Hoarder’s Son), self-help pages (e.g., Hoarders Helping Hoarders blog), and personal stories (e.g., Confessions of a Closet Hoarder). Many of these TV shows and blogs have compelling moments and provide some brilliant insights into tales of indiscriminate if not addictive consumption without organization or especially conscious reflection. What they often fail to wrestle with that is perhaps compelling to many of us is that much of consumption revolves around the ways we invest objects with meaning in forms that loosely unite hoarders, collectors, and most consumers. “Good” consumers have an imagination that allows them to place hope in many different material things and then impress those goods with idiosyncratic personal meanings or the optimism that they will one day use that object or be transformed by it. Collectibles occupy a liminal position in that much of their meaning is wrapped up in the thrill of the hunt (i.e., finding the thing is as significant as possessing it), and their utility is dependent on the ways the collection creates social relationships, demonstrates a collector’s knowledge, and provides a romanticized vision of the social world. Hoarding of course is not at all social, and most of our homes are in that odd middle ground that is an unplanned accumulation stocked with both the useless and the profoundly meaningful, even though much or all of it appears prosaic from the outside. Certainly at some level Hoarders’ popularity is a commentary on our own self-revulsion from within consumer society, since apparently we have few historical cases of hoarding and tend to implicitly frame it as a purely contemporary neurosis fueled by rampant consumption. Some of the appeal of such shows is their simultaneous skill in making us both sympathetic to and angry with hoarders whose human relationships and genuine health is routinely compromised by their seemingly irrational connection to things. But the unspoken appeal is in many ways our own recognition that we share some of this idiosyncratic and emotional connection to many things, so we see much of ourselves as consumers in the distorted mirror that is the hoarder. Hoarders end up being overblown versions of some of our basic consumer tendencies and perhaps even some of our common weaknesses, and that familiarity and simultaneous distance from its most neurotic dimensions makes these shows fascinating material culture studies and strangely compelling.